Mahendra Singh Dhoni was a railway ticket collector—many know that now, including, we guess, the IIT graduates who passed him by at Kharagpur station 17 years ago. What do Akshay Kumar and Rajnikanth have in common bes­­ides Robot 2.0? A nondescript first job—Kumar waited tables in Bangkok while learning martial arts; the Tamil superstar was a bus conductor with the Bangalore Transport Service. So how many of us take notice of those we talk to, glance at or drive past, while at their day jobs? If you ever saw a lanky factory watchman, called Naw­a­zuddin Siddiqui for inst­ance, would you guess he was biding his time for his cal­ling as a Bol­lywood star? Of course, Siddiqui probably didn’t know that even when he enrolled in the National School of Drama—the watchman’s job at a toy factory kept him going while at the institute. Before that, his first jobs included a brief stint as chemist in a factory in Baroda. And when was the last time you saw an accountant and wondered if he could be the next Vijay Sethu­pathi? Before the horror flick Pizza (2012) turned him into a star of Tamil new wave cinema, Sethu­pathi kept ledgers at a textile showroom—one of his many stints with num­bers bef­ore box office statistics beckoned. Or maybe an Infosys techie like Nivin Pauly, now one of Malayalam’s bankable new stars. Why not a banker then? Specifically at Grindlays, like Kishen Khanna was before he joined the Progressive Artists’ Group in 1950 as they broke new ground in Indian art. Or, for something less common, adman Piyush Pandey’s first job was with the Goodricke Group in Calcutta, tasting tea. But he didn’t stick around for long—he hadn’t crossed paths with Fevicol yet, you see—and headed for Mumbai. More mundane sights: someone selling chips and farsan on Mumbai’s Grant Road. That’s what Boman Irani did for 14 years, before he bec­ame a photographer. Then, in his mid-40s, he burst onto Bollywood to tickle everybody’s funny bone. A vacuum cleaner salesman? Think Rakeysh Omprakash Mehra. Perhaps a chartered accountant—wouldn’t we have been robbed of Masoom, Mr India, Bandit Queen and Elizabeth if Shekhar Kapur had hung on to his first job in England. Or a professor of English literature—sarod maestro Pandit Rajeev Taranath was appointed to teach at Bangalore’s Central College on the same day as the late U.R. Ananthamurthy. He moved to a few other institutes before deciding to pursue a career in music. Let’s talk politics: when you see an Income Tax officer, does a future chief minister of Delhi come to mind; one with a muffler, wielding a broom? Prime ministers? Well, there’s plenty there—contractor, tea-seller, pilot, professor. The list goes on, especially in this age of start-ups, YouTube stars and Masterchef. 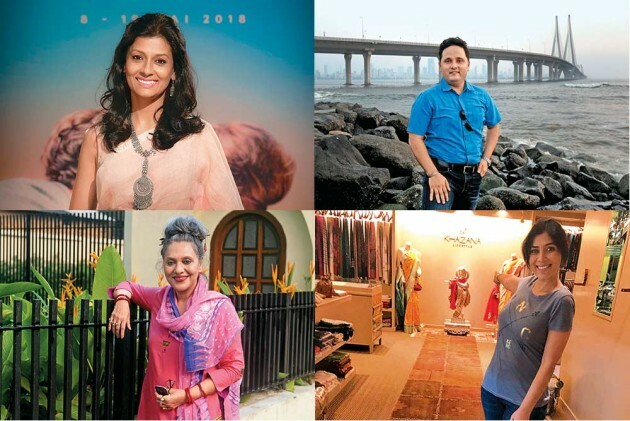 Outlook profiles the first jobs of six famous Indians. “For both my father, an artist, and my mother, a writer, work was never motivated by money. It was an extension of their passion and interest. I learnt early in life to do what you love and love what you do. So in my meandering life, doing multiple, varied things was never questioned; it was always encouraged. During my last year of school, my classmate Sudhanva Deshpande introduced me to Jan Natya Manch, a street theatre group. We would discuss and improvise plays on social issues like gender equality, secularism, worker’s rights etc., and perform these at street corners. Those four years with the group and its founder Safdar Hashmi were my earliest initiation into ­socio-political issues. After college, I would rush for rehearsals and return home ­exhausted. But I slept better then. It was not a ‘job’, but an experience to express one’s idealism and an opportunity to engage with people. I am glad that the idealism hasn’t faded even after so many years. After graduation, I decided to take a year off. That is when I taught at Rishi Valley, a J. Krishnamurthy foundation school. It was not to become a teacher, but to live away from the city and experience an alternative form of education that was more open and less didactic. I taught the fifth standard ­almost everything except mathe­matics! I realised that I loved working with people, and that the pursuit of theoretical knowledge was not for me. So I chose to do my master’s degree in social work. It’s not that a degree makes you a better social worker, but it exposes you to many realities that you are not aware of. And once you are exposed to those realities, you are driven to do something about it. Technically my ‘first job’ was in an NGO called Ankur, where I worked with adolescent girls in slums. After five years of work with NGOs—Ankur and then Alarippu—by sheer accident and no design, Fire happened. Unlike many, I didn’t grow up watching Bollywood films, so never developed an appetite for mainstream films. So when more offers to act began to pour in, I instinctively veered tow­ards independent cinema, even if it meant doing a film in a language I didn’t know. Acting and direction still form a small part of my life. Wearing these hats has given me a platform to share my social concerns. “This was a summer job right after Class 12. The people from Khazana (the saree store at the Taj Mahal Hotel in Delhi) came to our school to rec­ruit sales trainees. A friend and I were selected. When I worked there, every time a celebrity or a star visited, we were told to stay in the storeroom because we weren’t groomed to handle that clientele. This was around 1990. Sharmilaji (Sharmila Tagore) came once, and there was so much buzz about it, but I didn’t even get a glimpse of her. So you can imagine what I felt when recently, I went to Khazana after so many years—I was at the hotel for a promotional event—and the people there were asking, “Ma’am, what can we show you?” Now I could buy the best sarees. But the joy I got from buying two cotton sarees with my first salary...that is still unmatchable! I had a Rs 900 stipend, bas­ically Rs 30 a day—you took a day off and you lost a day’s wages, so I got just over Rs 800. The first saree was for my mum—she treasures that green and yellow Bengal cotton. For myself, I got a pink cotton one the next month. I left Khazana after two months when college started. The TV innings started in my final year at Lady Shri Ram College, where I was president of the dramatics society. My friend Supriya was hosting the ­music-themed show Albela Sur Mela, and one day her co-anchor didn’t turn up. So, she called and asked if I could fill in. I had an audition—they wanted someone who could speak fluent Hindi and memorise the script—and I was shooting immediately afterwards. This was Rs 500 a week—four times the pocket money I got from home! “It was 1969. I was in my final year of architecture at Madras, staying with my brother Rana and his brilliant artist wife Rani Nanjappa, nee Poovaiah, who was teaching at the School of Arts and Crafts. Many of her students would drop by in the evenings for lively discussions on art. Vasudev and his wife Arnawaz, Balan Nambiar, Viswanathan and others. K.C.S. Panicker, the head of the School of Arts and Crafts, had brought life to Cholamandal, the artists’ village along the Old Mahabalipuram Road. Vasu and Arnawaz had a plot there, and they asked me to design a low-cost house for them—my first job. I did a sketch on a rough piece of paper, a Greek cross in plan. A long hall in the middle with an afterthought of a loft, a bedroom and toilet on one side and a kitchen/dining room on the other. Low-cost, they had said, so I suggested they build it with casuarina poles supporting a coconut frond thatched roof, a half-brick wall over a light foundation and a simple white cement-topped floor. But they wanted a pucca house right away; their paintings must have begun to sell well. So the half-brick wall gave way to a regular one, while the roof became a Mangalore tiled one on wooden rafters. When it was built, it came out well—Arnawaz said quite a few visitors would come and measure their home, wishing to build replicas elsewhere. It stands to this day, fifty years hence. A couple of years later, Vasu asked me to choose any one of his paintings as my fee. I chose one, and told him that since I was planning to go Chicago for my masters’ in architecture, I would collect the artwork later. I never did. “Though I started dancing at the age of three, my first job, if you can call it that, was modelling. It just sort of happened to me. The year was 1968; I was 17. I was approached by the organisers of the Miss Calcutta pageant. I didn’t immediately say yes, but said I would think about it. I was also studying for a degree in English literature and wanted to pursue dance and academics. But everyone else was very ­excited for me, and my friends encouraged me to take it up. My only concern was my parents, who I thought definitely would not agree to it. But, to my utter surprise, they said ‘yes’. So I went and got some forms. I remember asking them to give me more than one form, as I knew I would probably discard a few after filling them up, because I thought I would change my mind and then have rethinks. I’m not very organised, and these are my defence mechanisms (she laughs). I am also a free spirit in every sense of the word, and I don’t like to be tied down by rules and regulations. I knew that joining a beauty ­contest would mean a host of restrictions, including ones on diet and going out. At that age, I was basically just having fun, and I didn’t want all that to come to an end. However, the idea of the experience really appealed to me. I thought, finally, ‘I do want to give it a try’. “My father retired as a small-time government servant in Odisha when I was in the eighth standard. From then until I graduated in the humanities in 1977, I was raised by my eldest brother. I wanted to study in Delhi after that, and do research and teach international relations. But I didn’t want to depend on my family, and banks back then gave loans only to engineering or medical students. So, I had to settle for the local university. Two months on, I felt empty, quit and took up the only job available in Bhubaneswar for someone my age: lower division clerk (LDC) at the state industries department. My teachers were shocked; my family was startled. At the secretariat, I was the smallest cog in the wheel. My salary was Rs 305.50 a month. My superior was the upper division clerk, and he reported to the head clerk, whBada Babu”. They didn’t give me much work after they realised it could create acid reflux for them. But the hundred or so non-gazetted folks, the “lifers”, loved and respected me; they saw in me a bright transient, and called me in to adjudicate their meaningless, intense, non-work-related deb­ates. I was barely 19, while most of them were in their 40s. The peons loved me too; one day they inv­ited me to the roof where a select, secret club smoked grass. I took a drag out of respect for them, but haven’t gone back to it since. A very fond memory I have of being an LDC is of being packed off to a remote village on election duty in 1976; I was number two to a polling officer. The voting age then was 21—I wasn’t eligible to vote, but could conduct the election. The secretariat taught me the importance of human dignity, mutual care and the need to look at work as part of life—and not the other way around. After a year there, I was selected to become a management trainee at DCM. Then the IT industry happened. Shortly afterwards,I had a failed start-up, and then, the great success of co-founding Mindtree came along. Along the way, a parallel career as a writer flourished. Now, 40 years later, I am back at the same secretariat as chairman of the Odisha Skill Development Authority. My charter is to create opportunities for employable skills for 1.1 million youth—mostly school dropouts at the bottom of the pyramid—and in the process, build a brand called “Skilled-in-Odisha”. “When I was young I had many passions. I loved history. I was the lead singer of my college band. I was even a boxer in school and college! Were they serious career options, though? Nope. Never. Remember, this was the early 1990s; India’s economic liberalisation of 1991 was yet to bear fruit. As was usual for a child born in the 1970s, I sacrificed passion for pragmatism, and I settled into a financial services job after doing an MBA from IIM-Calcutta. Over a fourteen-year corporate career, I worked in MNC/private sector companies in the fields of retail banking, mutual funds, private banking and life insurance. Obviously, it would be a flat out lie to say I was deeply passionate about financial services. But it was a ­career and it paid the bills. A corporate career has its share of insecurities, though not as much as a creative career. Salaries are higher today than they were for our parents’ generation, but so is the likelihood of losing your job. At one point, I was without a job for some six months. I had resigned from a company in a huff—because I was having huge fights with my boss—assuming I would get ano­ther job easily as I believed I had a strong CV. That didn’t happen. I did get offers, but they were lower-level positions that I refused. I did odd jobs: consulting assignments for small ­organisations and restaurants (and I am no foodie!). Ultimately, a very senior executive, who had worked with me earlier, called me and ­offered a good role. That taught me a few life lessons. It was immature to resign in anger; sometimes, you must set your ego aside and soldier on, because you have responsibilities to your family. I needn’t have suffered through an ­office atmosphere that was really weighing me down. But there is a difference between ego and self-respect. I should have searched calmly for another job and then resigned.